"A young veteran called us up last week from North Carolina. He had just bought 50 acres of land. He told us both of his legs had been ripped off in the war, but they'd been reattached, and now he was ready to farm. He's a perfect candidate for our program. 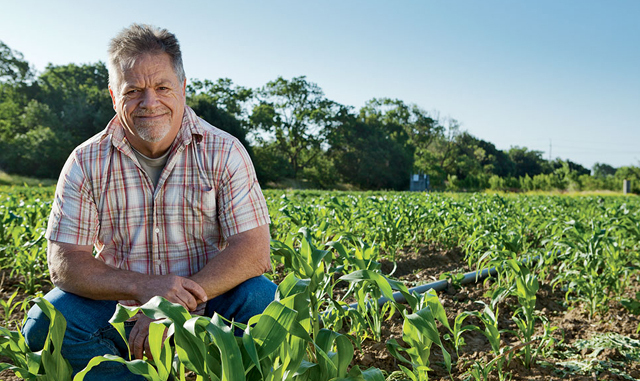 "I've worked in the organic-farming industry for 40 years. I visited New York not long after 9/11 and came across the statue of a guy beating his sword into a plowshare, and a lightbulb went off in my head. In 2007 I talked to some Northern California farmers about creating jobs for returning veterans. From the beginning, there's been something so positive about the concept. It transcends politics. "We do everything from introducing veterans to agricultural careers to helping them establish their own farms. Early on, I would go out and help vets plant and weed their fields. "This project grew out of the organic-farming industry, but we don't overemphasize that part. A lot of the veterans we work with grew up on family farms, and we're not about to tell them that their dad's not farming properly. These veterans are getting into farming because they are attracted to nature. They are looking for something healthy and peaceful. "One of the first vets we worked with had been injured in a mortar blast and had to relearn to walk and talk. Now he has his own blueberry farm. He's made the entire place wheelchair accessible and has started training other vets to farm. I've seen so many veterans come to our program with debilitating injuries and go on to thrive. COMING HOME Eighty-five percent of veterans with severe disabilities are unemployed, as are more than a quarter of vets in their early twenties. ON THE WEB Learn more about the Farmer Veteran Coalition at farmvetco.org.